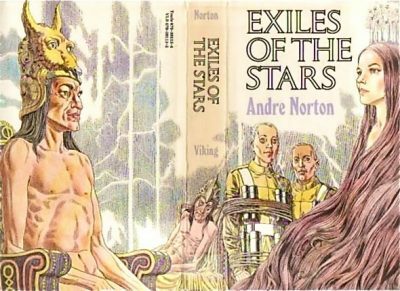 1971’s Exiles of the Stars is the first sequel to Andre Norton’s Moon of Three Rings. It was followed by 1986’s Flight of Yiktor and 1990’s Dare to Go A-Hunting, neither of which I will review (because they fall outside the boundaries of this review series1). Exiles picks up where Moon left off, with star-trader Krip Vorlund and alien witch Maelen the Moon Singer ensconced in brand-new bodies—Krip in the body of a Thassa and Maelen in the body of a small animal called a glassia—and on their way to the stars on the Free Trader Lydis. But they’re not out of trouble yet. From the start, Lydis’ contract on Thoth had a whiff of danger. Nervous theocrats, threatened by religious strife and civil disorder, have hired the Lydis to transport precious artefacts, relics of a lost Forerunner race, to safety. The destination: Ptah, one of the other worlds in the Amen-Re system. A temple insider leaks the news that the priests are sending holy artefacts off-world. Even as the precious cargo is loaded aboard Lydis, angry mobs converge on the starship. Only the customary prohibition against attacking Free Traders can defend the Lydis. They manage to escape from the riot-torn world, but worse is yet to come. Getting to Ptah will prove more challenging than expected. The problem with transporting a hastily assembled assortment of alien artefacts is that among them may be modern devices placed among the relics for non-religious purposes—such as sending a star ship off course. The Lydis is lucky enough not to be left helpless and adrift in deep space, where it would be easy prey for jacks2. They manage to make landfall on the desolate world of Sekhmet. The ship cannot lift again; now they are marooned. Sekhmet has never been settled because there’s nothing there that isn’t more easily obtained from more pleasant worlds. However, it is at least habitable. Even better, there is a Patrol beacon the Free Traders can use to summon aid, although it is located inconveniently on the other side of the planet. If they manage to make it there and summon aid, they will face yet another challenge: the priests who were to pay them died in the chaos back on Thoth. The crew of the Lydis faces bankruptcy, the loss of all they have worked for. It turns out that there is something of value on Sekhmet: Forerunner relics, remnants of the forgotten race that once dominated this system. Of course, just as everything else in this adventure has been one step forward, two steps back, there’s a danger concealed in the relics. Within the carefully preserved bodies of the ancient aliens, sparks of life still persist. The aliens have survived for uncounted ages, lacking only fresh bodies to live again. Fresh bodies like those possessed by the crew of the Lydis…. This book seemed oddly familiar. I had the feeling that I had read it once, years ago—but I had no memory of when, where, or even what edition. I checked the cover art for every edition listed on ISFDB, but none of them looked familiar. I also checked my saved SFBC reviews without finding anything. However, as hundreds of reviews are missing from that folder, I might have read it for SFBC. But not for any omnibus editions (of all three books in the Moon of Three Rings series), because when I read Moon for a recent review, I was sure I was reading it for the first time. This is a puzzler. But at least not a life-threatening puzzle, such as those faced by the crew of the Lydis. Reading this book only reinforced my recent realization that for Norton, Forerunner is a generic term covering many extinct, technologically advanced races. It also drew my attention to a detail of this setting whose significance I had previously overlooked. Often, when speaking of duration, Norton’s characters refer to planet years. Ship years are not the same! Norton never tells us just how different they are. My impression is that time passes more slowly on a ship than it does on the ground. This would drive a further wedge between the lives of starfarers and the planet-bound3. The book has some disturbingly von Dänikenesque elements; a few characters note similarities between the Forerunner artifacts and what they know of ancient Egypt. Could it be that ancient astronauts … nah. Norton just hints, doesn’t commit. Her characters waffle, saying that too much of Earth history is lost to draw conclusions one way or another. It’s clear from her bibliography that Norton was interested in Egypt and North Africa; perhaps she knew too much to believe in the ancient astronauts crap (racist twaddle invented to explain away the accomplishments of the Egyptians and other non-European civilizations). Further musing: perhaps the Time Trader and Free Trader Nortons are set in different timelines. The Free Traders believe no Forerunner artifacts were ever found on Earth, while the Time Trader books are all about Americans and Soviets stumbling over alien artifacts. Wait, perhaps I can retcon this: Operation Retrograde was classified. Maybe the truth never came out because American and Soviet governments wanted to take credit for starflight technology. If so, we can fit both series into the timeline in which Zacanthans exist. Moon was science fantasy; this novel is much closer to a specific sub-genre of horror I like to call kill all archaeologists before it is too late. In most Zacanthan-sequence stories, archaeology4 isn’t excessively dangerous. After all, the supremely wise Zacathans do it and many of them survive the experience. In this novel, inquiry into the mysteries of Sekhmet wins a booby prize: body-hungry revenants eager to commandeer new mortal forms. At least these particular body-snatchers aren’t bright enough to try to bribe their way into new bodies by tempting the traders with valuable forgotten lore. There have been a lot of kill all archaeologists SFF stories over the years, not just from Norton. Even the sub-genre of stories with body-hungry ghosts is pretty extensive. Norton makes her version stand out by setting it in space and by dividing the narrative between human(ish) Krip and (formerly human) Thassa Maelen. Each has a distinctive perspective on events. There have been many editions of Exiles to the Stars over the years. Used bookstores, online and real world, are your friend here. 1: A series which (in case you have tuned in late, or forgotten) was inspired by a specific back-of-the-book ad Ace ran during the Disco Era. 2: What happened to the jacks, you ask? They met a bigger fish. 3: Which raises a further question: whose years are being used when one character comments that humans left the Solar System a thousand years earlier? 4: It’s not really clear to me to what degree the humans have what we would recognize as science, as opposed to older forms of scholarship with which a Roman or Greek philosopher might be familiar.